Soul food restaurants are as common as the 7 million people who signed up for Obamacare. However everyone knows that the plethora of thing does not equal the consistency of a thing. I mean after all it is not like McDonald’s. First up on deck the “F-Que” wings with a house made pepper jelly sauce. Now there is always a subconscious moment that occurs when eating wings, a voice inside that whispers how happy you are to have your original front teeth or thank goodness you didn’t skimp on those dentures that may slip at most inopportune time. Whenever you eat wings whether baked or fried there is always an initial tug of the wing during the first bite; but when eating SoCo’s wings none of the fore-mentioned applied one bit. These wings were fall of the bone tender. Even with the jab of the wing with my fork almost rendered the wing deboned. 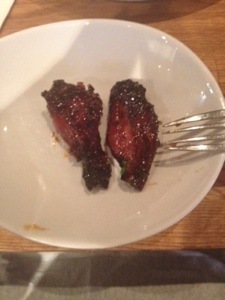 The wings were slightly spicy, slightly sweet, and the slight char of the skin, equated to absolutely deliciousness. 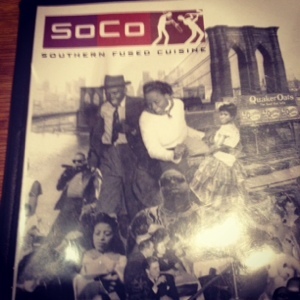 As the edible journey continued, next up was the “Lobster & Shrimp grits.” I have to write, I am a grit lover and I know that there is a secret to creating creamy, flavorful, lump free grits, and it was apparent that someone brought SoCo in on the secret. 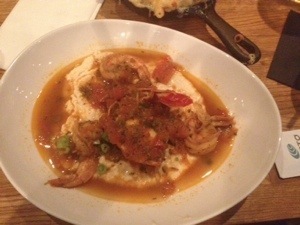 Those grits were beautifully buttery, fantastically flavorful, and completely lump free, and the tomato broth added a smokiness, that was truly superb. Generally I am not a lobster fan, yet for some strange reason I always try lobster when mixed with other food just to see if the hype about sweet lobster tails have the propensity to make my heart sing. These grits with lobster and grilled shrimp was a wonderful pairing and I must write, my heart did indeed do a little diddy. The climax of the evening was “Aunt Cruz’s” macaroni and cheese. I have always believed that the taste of mac and cheese is purely subjective, unless it is burnt of course and it taste like you are eating burnt popcorn. There are some high end restaurants who tend to create a cheese sauce to develop more cheesiness, then you have other establishments and home cooks who use velvetta to create more cheesiness. My preference is tight mac and cheese, I don’t want to see cheese sauce at the bottom of the pan, nor do I want to taste loose mac and cheese. 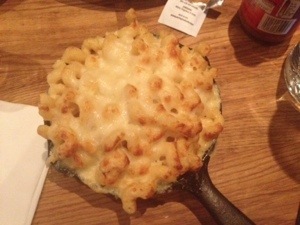 Sure the presentation of the mac and cheese at SoCo was visually inviting as they brought it out in a cast iron skillet and the portion side was gargantua. But they level of cheesiness in this mac and cheese was so intense it veered on the side of pungent. So pungent that my taste buds could barely handle it, hence I was forced only to take a few bites. It is because of this that SoCo did not hit a jackpot for me, but “still winning” is a great place to be, so well done SoCo, well done. This restaurant sounds like a place I don’t mind eating at when I visit.